Los Lagos or Selva Blue is a lodge surrounded by some 300 lakes each one connected by artificial canals to keep the level of the water. These ponds and canals were made thousands of years ago and these are some of the evidences of the great archaeological culture of Moxos that began in the area about some 4000 years before Christ. 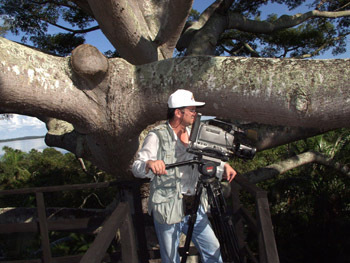 Locations to visit: Villa Marina Lodge, Arroyo de los Manechis, Laguna Dichosa, Observation Tower “Guapango”. We leave in our 4X4 vehicle from Los Lagos Lodgeand head to Villa Marina Lodge, which is set at the shores of the Laguna Dichosa (Blessed Lake) in a short but exciting drive along the savanna, admiring along this journey a large amount of birds and from time to time some mammals.Once we reach our destination, our boat will be waiting. We continue our adventure sailing along the lake, heading to the Arroyo de los Manechis (Black Howler Monkey Stream) that transports you to a wild land of mystery. When we reach the part where it flows into the Laguna Brava (Bad-tempered Lake), we turn back sailing again along the stream, discovering the loud black howler monkeys on the trees, which gave the stream its name. We sail alongshore the Laguna Dichosa, until we reach the pier that leads to our tallest Observation Tower “Mirador Guapango” to continue on foot. From the top, take in the panoramic view of this magical region. We return to Villa Marina Lodge, where we enjoy a beautiful sunset at the pier, as we admire the stunning panoramic view of the lake. 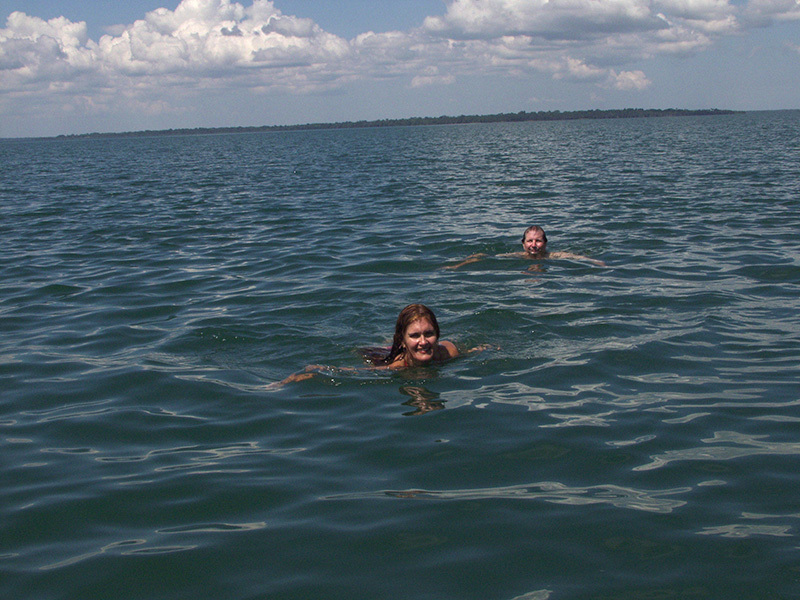 After a short break we head back to Los Lagos Lodge. Your day starts before dawn from Los Lagos Lodge’s pier, where your boat awaits to take you to the Arroyo de las Parabas (Macaw Stream). As you sail along Lago Largo admire the flocks of birds that fly across the sky. Discover in the beaches as well as among the bushes of the dense vegetation which frames this stunning lake, other species of birds, reptiles and from time to time mammals that at this early time of day feed on the plants´ tender shoots or look for unsuspecting preys drinking water in the shores. As you admire a beautiful sunrise, the silence is broken by the guttural sounds groups of black howler monkeys make. And as we continue along the Macaw Stream, you will discover in the stream’s crystal clear waters an array of fish as well as other animals on the shores, and the dead palm trees which are the nesting places of the amazing macaws. 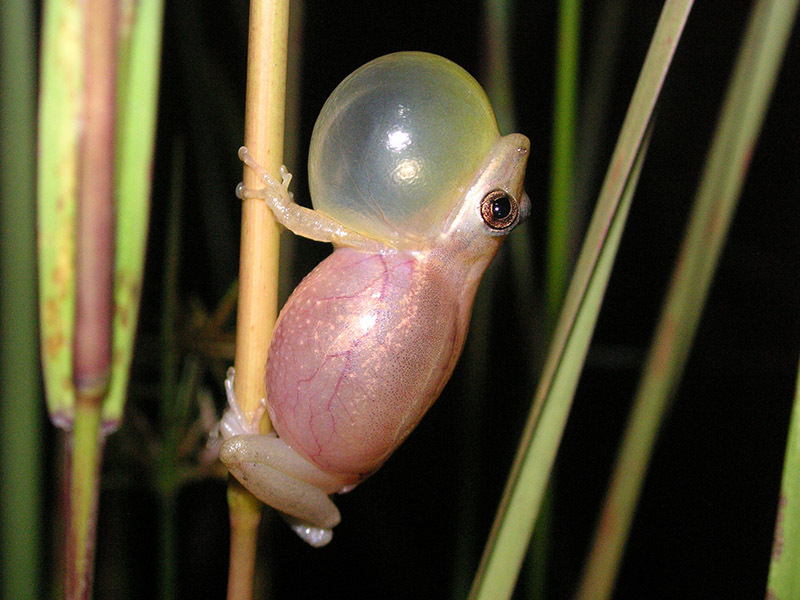 Look up to spot these impressive creatures that fly across the moriche palm forest with their characteristic loud screams. Return to the Lodge. 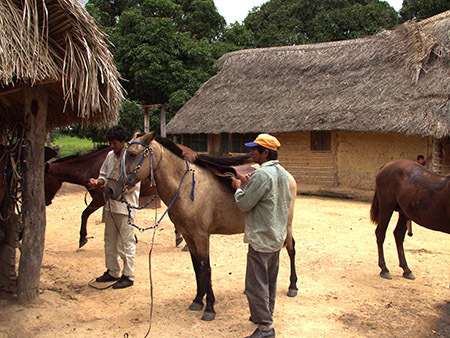 Amazonas Lakes, located in the Amazon basin, is the only resort in the Amazon, with an extension that surpasses 100 square kilometers (24710 acres) of private protected area. 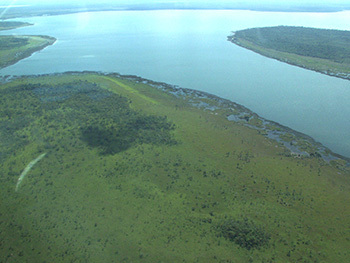 Our protected ecoregions include Amazon tropical forest, Amazonian neotropical Savannas, Floodplains and Grasslands, Lowlands, and Wetlands (marshes, swamps, lakes and streams). Although we are not an official Reserve, we are working towards becoming one. 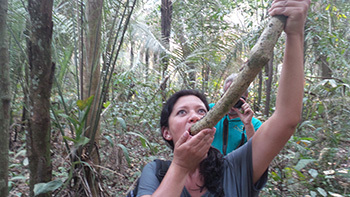 We are deeply committed to the conservation of the wonderful Flora and Fauna of this part of the Amazon. Through Tourism we expect to preserve these amazing lands and to support our Wildlife Conservation Projects. 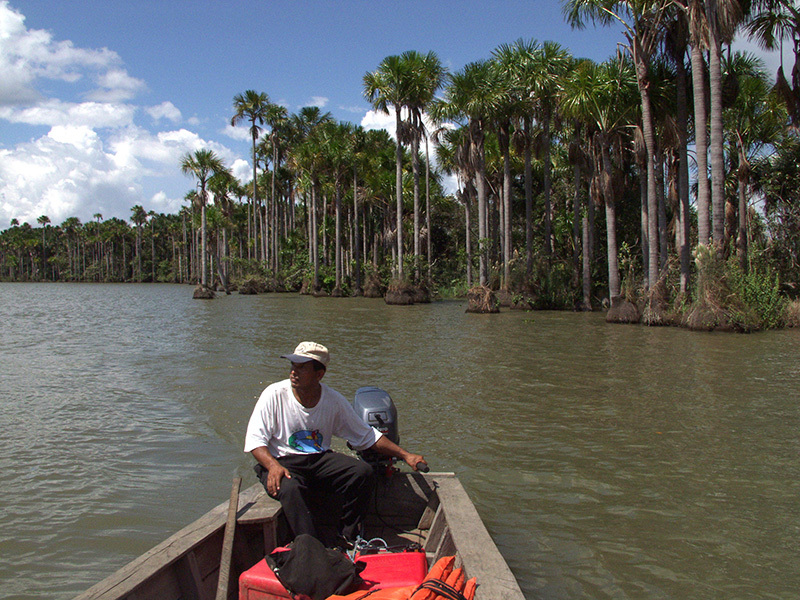 Amazonas Lakes offers sanctuary to the fauna and flora. Our projects include zealously protecting our 100 square km (24710 acres) so that the fauna may find refuge and protection from hunting here, as we have done thus far, keeping our core centers undisturbed maintaining their incredible fauna unwary of humans and prevent our unavoidable footprint, becoming an Ecological Resort and minimizing our consumption of fossil fuels by shifting to renewable power sources when possible, educating our local staff and our tourists as well as influencing our community to become more ecologically sensitive. Our end goal is to become a sanctuary to all the fauna, to become a conservation and research center, with Reintroduction Programs of endangered species. There is still a long road ahead of us but we are certain that with passionate and dedicated effort we will achieve our goals. Impenetrable Swamps and areas of virgin Jungle are part of our highly protected areas within the Resort, kept undisturbed as core centers, in order to preserve them. Our goal is to safeguard them with no interference whatsoever from humans and by keeping these areas inaccessible we can ensure that no illegal hunting or logging takes place. Dither Cuellar is our lead Ranger; he is in charge of the protection of the wildlife as well as enforcing our regulations and he is our guide extraordinaire. At the moment he is our only Ranger. 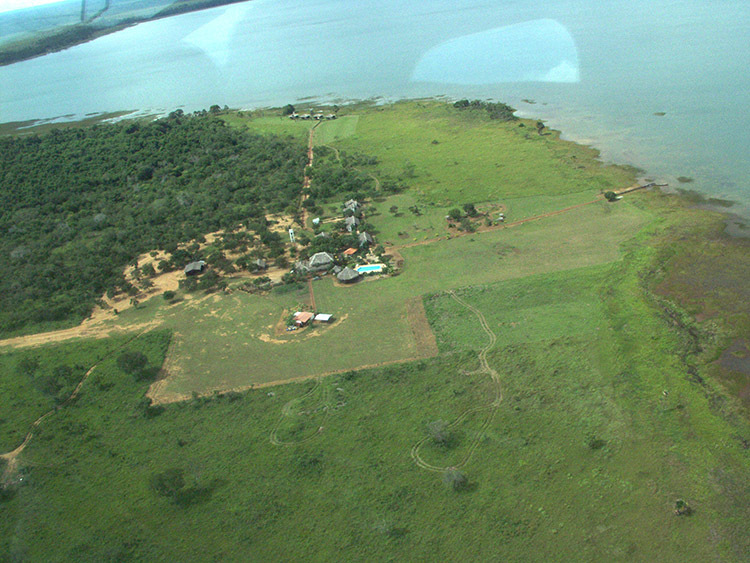 This small pond, with the shape of a stingray, is fed by a bifurcation of the Black Stream that flows south to north and discharges its waters in the Blessed Lake (Laguna Dichosa). It is also part of our Core Centers. These ponds are surrounded by swamps and in some parts covered by aquatic plants, which is why they are practically inaccessible. These ponds are part of our private protected areas. 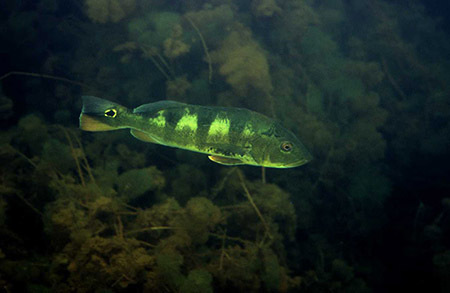 The Delta, with an extension of approximately 10 kilometers, is one of our strategic spots for sport fishing (Catch and Release) of Peacock Bass (Chicla Pleiozona). However only 20% is used for this purpose and the remaining 80% is under protection, since the nesting places of these amazing fish are found here, as well as at the Lacustrine Islets. These islets are in addition a small paradise of the lacustrine biodiversity. With our last effort of wire fencing our property we have successfully been able to almost completely stop illegal hunting inside our property. Controlling and enforcing our regulations has become easier. We are happy to observe that more animals roam our lands, finding refuge and seem to feel safe. Our objective is to become almost entirely self-sufficient, which is why our Menu is based on produce that we can grow. This way we can minimize our fossil fuel consumption. Our current production includes all the fruits used in our Menu, herbs and some types of vegetables, as well manioc and plantain. Our goal by building our aquarium, which is almost finished, at Los Lagos Lodge is to reduce the consumption of fossil fuels from our boats to go fishing and supply the lodges. Ethical fishing practices will also be in place at the aquarium. Beef, milk and its byproducts are supplied to the lodges for our guests as well as our staff. The meat is very lean, and growth hormones are not employed. 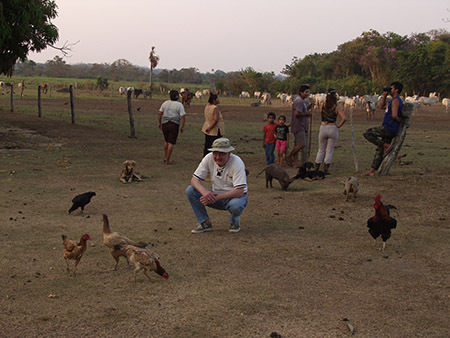 Rancho San Antonio promotes sustainable management, and ethical and gentle farming methods, with natural grasses, low environmental impact and no factory farming, battery farming or animal cruelty. Our other beef supplier also supports ethical farming. 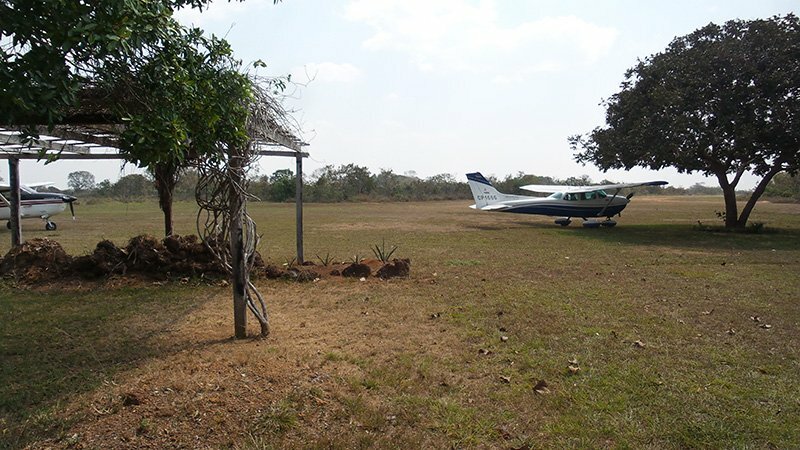 Villa Marina, located at the shores of the brown water Lake (Laguna Dichosa), set deep in our Natural Private Preserve, offers you a chance to connect with an untouched nature, to find appreciation for its emblematic flora and fauna, relax and find utter peace in the middle of the Amazon Basin. Amazonas Lakes Resort has two Lodges, Los Lagos Lodge and Villa Marina Lodge, both with direct view of the lake from all their rooms. 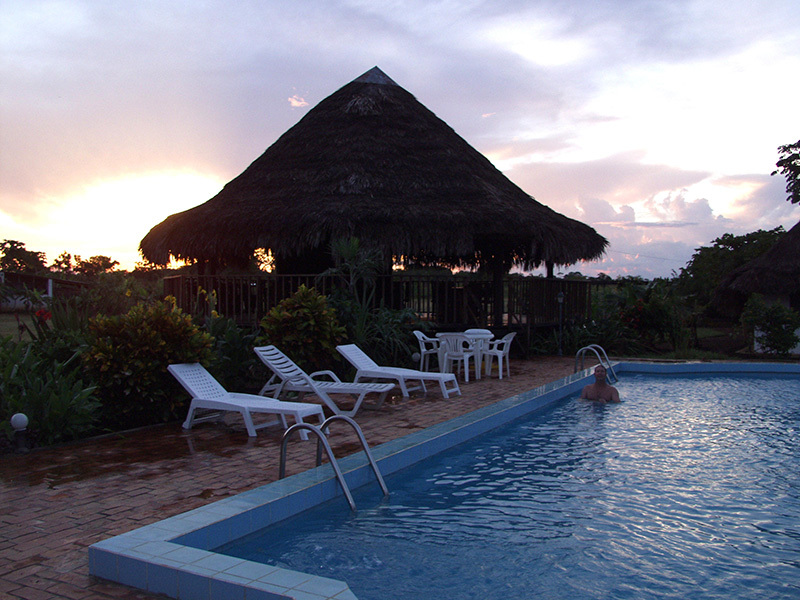 Los Lagos located at the shores of the crystal-clear Lake (Lago Largo) with comfortable suites, restaurant, bar, pool, gardens and a park with a large variety of tropical and exotic fruit trees. 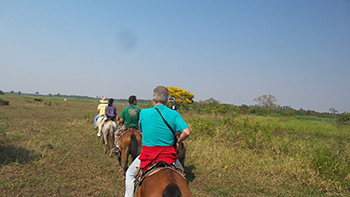 The facilities that the lodge selvaBlue provides cover a high level of expectations of visitors. Dawn and Dusk, are spacious and bright rooms with large windows so the light get inside easyly. These suits offer a wide and fabulous view of the lake and gardens. So it is very likely that we are awakened by the singing of birds. The suites have a mixed between contemporary decor and rustic, simple, cozy and comfortable styles that meet the city conveniences including air conditioning. Enjoy spectacular sunrises either from the comfort of the bed or from the terrace. The Colonial rooms in Los Lagos Lodge are simple and comfortable, airy, with a sober decoration between contemporary and rustic. In confined spaces, these comfortable rooms have prioritized the spectacular panoramic views of the Lake and Gardens. 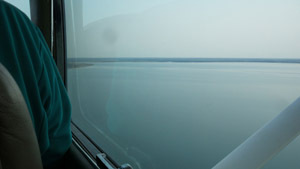 Fully enjoy waking up to the chirping of birds, in the comfort of your room with lake view. • Use of kayaks 6:00 a.m. to 10:00 a.m.
Our rustic cabins are charming, comfortable and cozy with rustic decor. Very conveniently located between the pool and the bar provides all the conveniences of the city, including Air Conditioning service and have an amazing view of Long Lake. 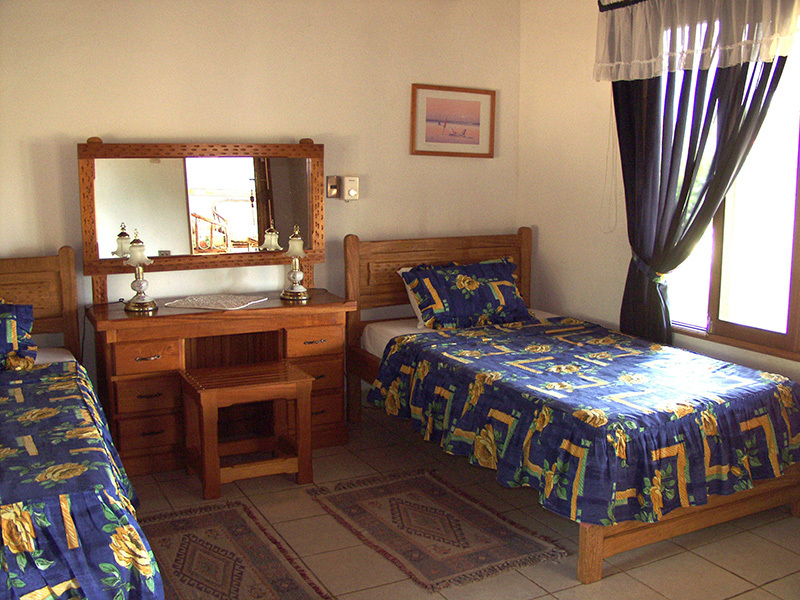 The cabins are ideal for enjoying the sunrise right from the comfort of your bed or from the terrace. The Rustic Lodge Villa Marina cottages offer warm, welcoming and attractive environments with rustic décor in harmony with the environment. 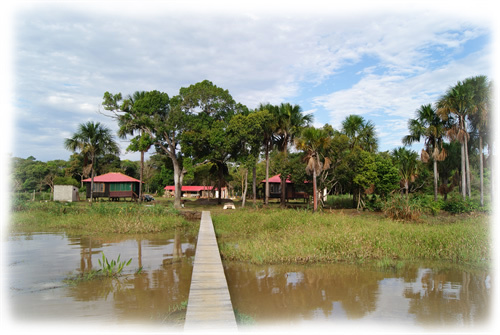 The cabins have panoramic views of the Amazon Forest and to the lagoon "La Dichosa" with its murky water. "Tropical Flavors, Fresh Ingredients in Los Lagos Lodge"
Our restaurant, casual yet elegant, stands out for its rustic décor with touches of elegance. Intimate atmosphere and a cozy atmosphere contrasts with its wide open spaces and well-lit. Exotic ceilings, built with palm leaves, wood floors and colorful walls give that tropical feel. These warm environments are mixed wiht a gentle refreshing breeze from the lake, which provide a break from the midday heat. Let yourself be pampered by our friendly staff. The restaurant is located in the heart of the lodge, opposite the pool and bar, and very close to the rooms and Long Lake. This place has capacity to accommodate 40 guests. The covered terrace offers an excellent opportunity to enjoy the panoramic view of the lake breeze and nature during lunch. Accompanied by the singing of birds and the murmur of the waves of Lago Largo. Tasting the delights of the local cuisine. The warm night breeze, under a starry sky, creates a ideal for those romantic couples. The dinners by candlelight are subject to availability and are exclusively under reserve. 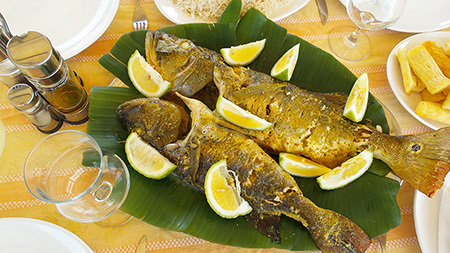 Traditional, tropical and fresh ingredients, describes the cuisine of this region. A culinary adventure, experiencing new flavors and a new culture. We offer a range of regional, national and also international dishes. The menu varies according to season and its contents are subject to what has been caught or farmed in the town of the lodge or in the same region. Beef and fish are the major proteins in our menu, reflecting the culture of the area. The fish is caught by our staff and comes from the nearby lagoons. It is fresh fish from the lake to the plate, can not be betterl! Beef is supplied by the Rancho San Antonio, which promotes the sustainable management, low environmental impact, using natural pastures without animal cruelty, which is reflected in the quality and taste of the meat. The menu in Los Lagos Lodge includes traditional dishes while offering international cuisine a la carte. Start the experience with some of the house cocktails made with exotic fruits in the region, or accompany your meals with our domestic wines or some of our finest South American wines. Please note that for the Beni-style Barbecue, reservations are necessary. Also serve vegetarian, vegan or other dietary restrictions groups. Let us know your needs so advanced, when planning your trip, to prepare some options.